John Regali fishing the Nong at Flemington area with the urban Angler and his son Joseph. The conditions were terrific calm and overcast. The fishing was consistent all day producing many under size Bream and 5 Bream over 30cm. The guys trailed a number of baits from Pilchards, Prawns & Scrub worms however the Maggots consistently out fished all baits on the day. 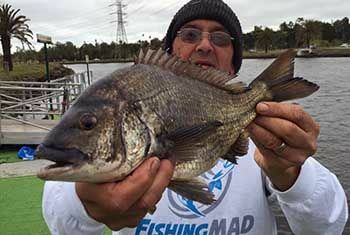 The best catch of the day was a ripping 37cm Bream which took a maggot near the structure of a nearby bridge pylon. Well done John.